A meeting to discuss an analysis of the Blueprint for Education is planned tonight [May 12] at the Berkeley Institute Staff Room from 6:00 to 8:00 pm and interested members of the public are welcome. The independent analysis of the recently released Blueprint for Reform in Education was prepared by Dr. Dennis Shirley and Dr. Andy Hargreaves, two internationally recognized researchers based at Boston College. The analysis was commissioned by the Coalition for Community Activism in Bermuda (CCAB) in mid-April and the document provides commentary on several key strategies of the Blueprint. The public has until May 15th to submit comments about the Blueprint to the MOED. The analysis by Dr. Shirley and Dr. Hargreaves commends the government’s reference to the Hopkins Report, the achievement of a vision, mission and target outcomes, and the selection of the Cambridge Curriculum. 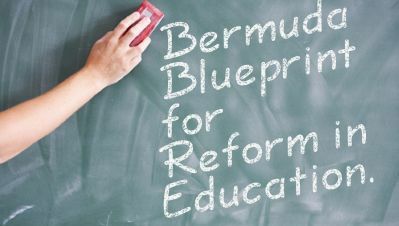 It also makes several recommendations for the future of Bermuda education. The analysis suggests the need for a more inspiring, Bermudian focus in the vision and caution about the degree to which testing, accountability and standards systems actually lead to improved student learning. The reviewers also recommend addressing the issue of an autocratic, managerial culture that exists within the education system and building active trust based on respect, personal regard for others, competence and integrity. CCAB is a non-profit, non-partisan volunteer group which serves as a resource for the community to promote democracy-building and active public engagement in an effort to address social justice and sustainability issues. The group sought the independent analysis in order to assist the public to make informed responses to the MOED.